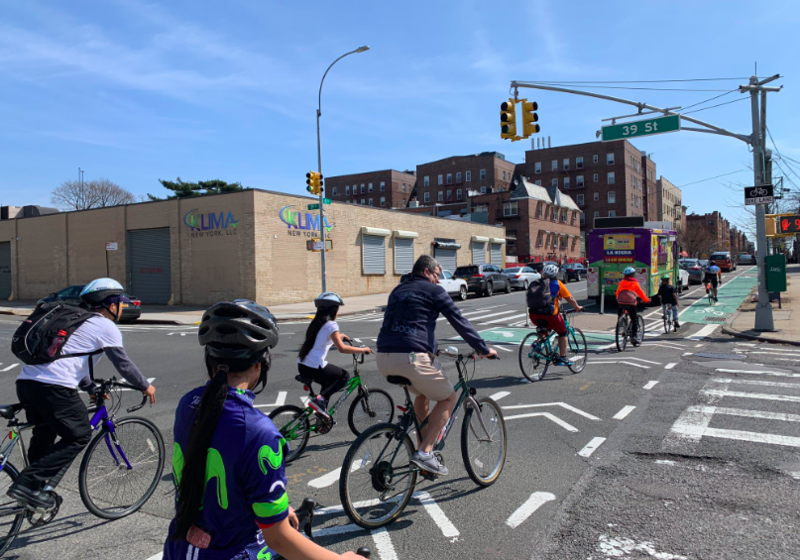 We want to start by thanking volunteers and Transportation Alternatives for Sunday’s memorial ride to mark the second anniversary of the death of Gelacio Reyes, the father of three and delivery worker who was killed on then-unprotected 43rd Avenue in Queens in 2017. Reyes’s death remains an open wound for his friends and family, but it did leave a lasting legacy: the roadway now features a protected bike lane — the result of activism in the face of a Sunnyside community board that preferred on-street car storage to safety for residents who chose to get around by bike. Kudos to the mayor and the DOT for overruling the board and bringing sanity to that little slice of heaven in Queens. Lots of subway cars are going out of service because of … grafitti? A nice scoop by The City’s Jose Martinez. There was so much carnage over the weekend. Some was on Park Slope’s awful Fifth Avenue (Doug Gordon), in that part of Queens out by Nassau County (Streetsblog, NY Post), near that same part of Queens (NYDN, NY Post), in Prospect Heights (Christophe Hille, NYDN), and in Woodside (NBC4). Fact: cars are antithetical to urban life (though not, clearly, death). The Daily News op-ed section published a piece by TransitCenter Director of Research Steven Higashide and MTA board member David Jones that reminded us anew that fare evasion is really the MTA’s fault. And NYDN columnist Harry Siegel wrote about the side-benefit of congestion pricing: Safer streets! Cops are asking the public to help ID the insanely fast driver who hit a kid in this horrifying video — then fled (NYDN). The Post interviewed the hit teen, who is, luckily, safe (NY Post). We posted the video at the bottom of this story. Did anyone really think the MTA was going to record the faces of drivers at high speed? The Wall Street Journal‘s Paul Berger reports on a failed test. Fairest city in the country? Under-rated reporter Nathan Tempey showed otherwise in the Daily News. And, finally, Joe Angio had a rough experience at Hudson Yards. The City reported that future expansion of the Second Avenue subway will require the use of eminent domain and could make dozens of families homeless. The typically pro-car Queens Chronicle actually covered last weekend’s Travers Park protest with a nod to pedestrian safety (probably because bikes aren’t involved in this particular car vs. pedestrian battle). Patch had been getting better over the last few months, but…two steps forward, one step back. On Friday, the local site wrote up a story about fears of Upper West and Upper East Side residents that congestion pricing would turn their neighborhoods into parking lots. The story violated the rules of Journalism 101: “reaction” stories are fine — so long as the people quoted actually have some expertise. But giving over 500 words to uninformed people only makes your readers uninformed, too (as Eric McClure pointed out). Better still, Charlie Komanoff already debunked this fear in Streetsblog. We were happy to see Gotham Gazette do a feature on Jeff Novich and his essential Reported app. Download it today and start making a difference.